Nice Concept, Shame About the Coffee. I’m a sucker for subscriptions. I love anything where you pay so much a month and you get something through the post – especially if it is something that will introduce new things to me, like Graze or the organic veg boxes I sometimes get from Riverford. It’s like getting a little present through the post, and takes away some of the bewildering choice in life without taking away the adventure. Yes, I am so sad that getting some nuts in the post is an adventure. So, when I got the chance to try Kopi, I was pretty excited. 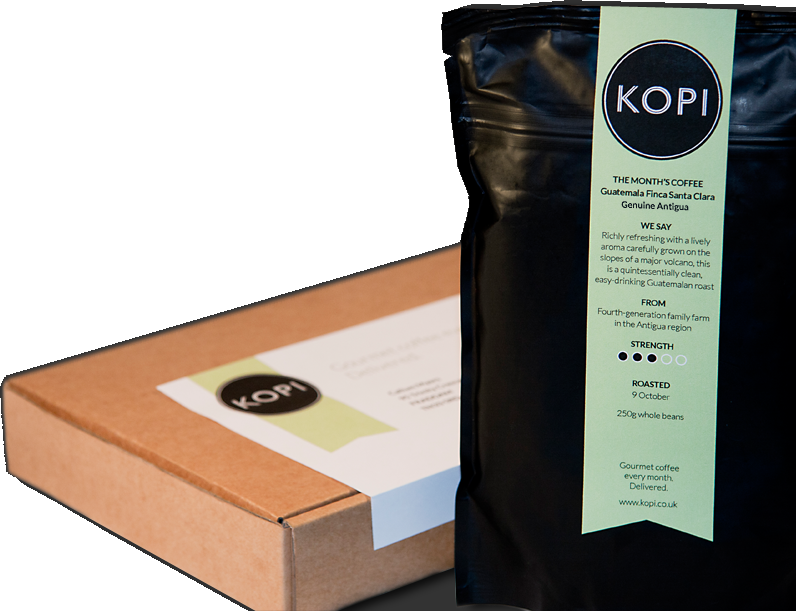 Kopi is a subscription scheme for gourmet coffee. So, you pay your £9 a month (or less if you pay for a few months at once), and you get a little package of posh coffee. Brilliant. With each 250g packet, you get a little leaflet all about the coffee – origins, tasting notes and so on, and it all fits through your letter box. We even got a couple of those tiny biscuits that you get in coffee shops. We drink a lot of coffee in our house. We have two little children, at least one of which will be in our bed by the morning, we study and work and we have an unfortunate habit of staying up late watching reruns of 321. We sometimes treat ourselves to a bag of coffee from Pumphrey’s in the Grainger Market, Newcastle, but mostly we drink normal co-op ground coffee, and our coffee machine is set to percolate just before we wake up every morning. My mum even keeps a cafetiere at her house for when we visit. We like our coffee. I got Mexico Terruno Nayarita Reserva, which was apparently light, yet creamy, with a hint of spice and orange. Sounded lovely, and I would love to say it was, I really would. I can forgive a lot from a subscription scheme (wasabi peas from Graze, anyone?) but I just couldn’t see how this coffee could be worth £9 for 250g. We made our first pot in the machine and it came out quite strong, so I tried again in the cafetiere, measuring the coffee carefully. That was slightly better, and if I concentrated I could just about make out the taste of Christmassy spice, but not very well. I take milk in my coffee, so I asked my husband about his. He told me he couldn’t tell any difference, then moaned about it being too weak. Now, it could just be that we ended up with a blend that didn’t suit us, and maybe next time it would. On the strength of this pack, I wouldn’t be keen to fork out more than an hour’s wage for the next box. Maybe we’re just not sophisticated enough. Thank you for taking the time to review the coffee. Must admit we were really surprised by your tasting experience – as very unusual. Did you use 50g for the large cafetierre? In any case, would we be able to send you the January coffee (www.kopi.co.uk/jan2012) to compare? That would be great – like I say, I was disappointed as I had high hopes. I would be very happy to give it another try.